There are only a few prairie species in our area with a Coefficient of Conservatism of 10. One of these is prairie dropseed, (Sporobolus heterolepis), an important grass species which is much more prevalent farther west. 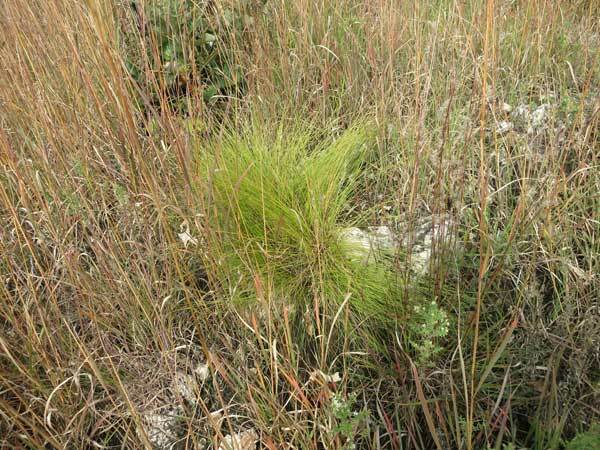 According to the Atlas of Wisconsin Prairie plants by Cochrane and Iltis, prairie dropseed is an indicator of unplowed and relictual prairies, especially in dry-mesic and mesic sites. 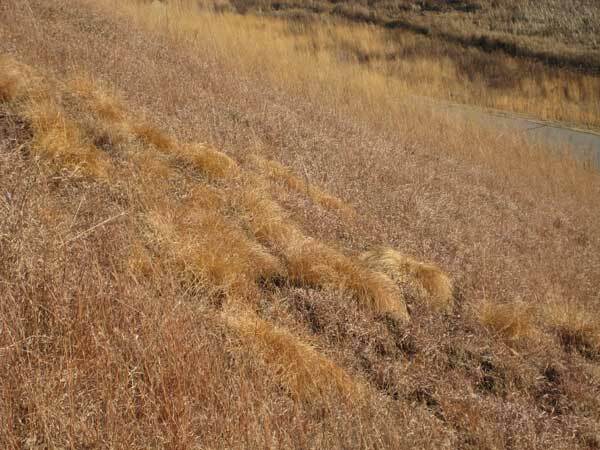 According to the USFS fire effects database, prairie dropseed grows in mesic prairies, well-drained moraines, rock outcrops, glades, open savannas, barrens, lightly grazed pastures, and along railroad and highway rights-of-way. 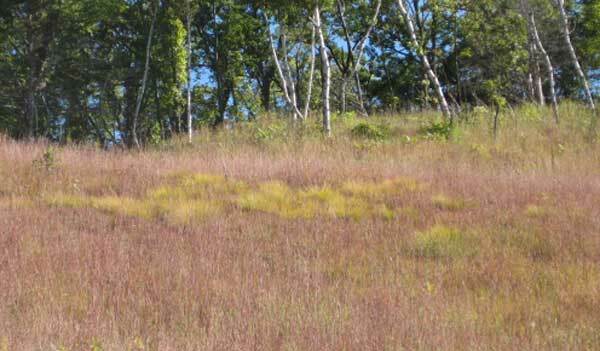 It is considered a climax species that is codominant with little bluestem, big bluestem, and Indian grass. It is a deep-rooted, long-lived, and drought-tolerant perennial which does well as a ground cover for hot and dry sites. According to Weaver's work in Nebraska, even relatively small dropseed colonies may have roots extending as deep as 4-5 feet into the soil. It is a classic "bunch" grass, and each bunch can remain in place for many years. Prairie dropseed benefits greatly from fire. 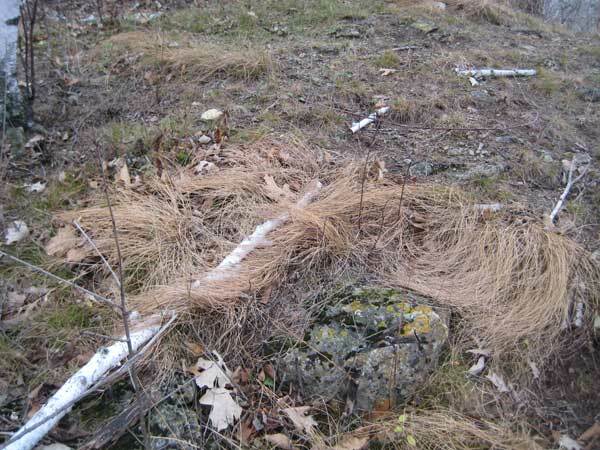 According to the USFS fire effects database, fire promotes flowering and seed set. In a Wisconsin study, fire increased flower production by 25 times, vegetative cover by 30 times, and the average plant height by 4 inches. As befitting a C4 (warm-season) plant, prairie dropseed is only found in open sunlight or at the edge of savannas where full sunlight is still available. At Pleasant Valley Conservancy there are nine locations where prairie dropseed was remnant, and in addition we have been successful in establishing it from transplants raised from seeds collected on site. In the table below, the original remnant populations were in Unit 1, 2, 3, 3A, 4, 6, 7, 9, and 10. It was planted and is thriving in the Cabin, Pocket, Ridge, and Toby's Prairies, the East Basin Prairie, and Unit 11A savanna. Its presence in the Circle and Triangle might have been either from remnant or planted sources. Left out of this table are the several plants present among the rocks on the East Overlook. Photos of some of these populations are shown below. Long-term dropseed population in the upper part of Unit 1, surrounded by little bluestem. After the first burn in 1997, this population flourished, with extensive seed set. A second remnant population in the lower part of Unit 1, visible from the Quarry trail. Dropseed establishes well in rocky areas. This remnant plant has been thriving for a number of years at the lower end of Unit 10 savanna. 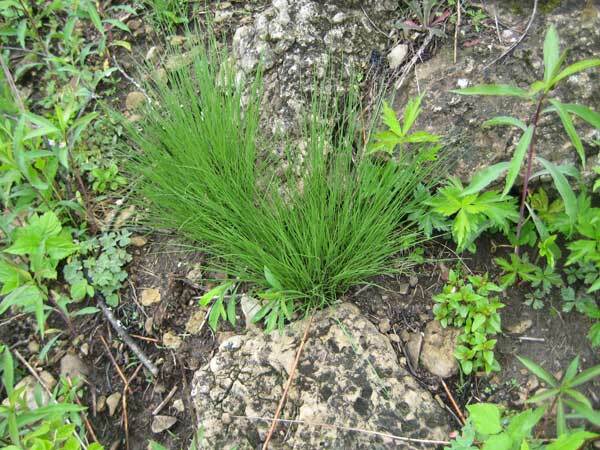 There are 8 or 10 dropseed plants growing as remnants among the rocks on the Rocky Overlook (Unit 6). These plants are best seen in the late fall of the year when their distinct brown color stands out. because it retains its bright green color longer. This plant in Unit 10 savanna is growing among the dolomite rocks. 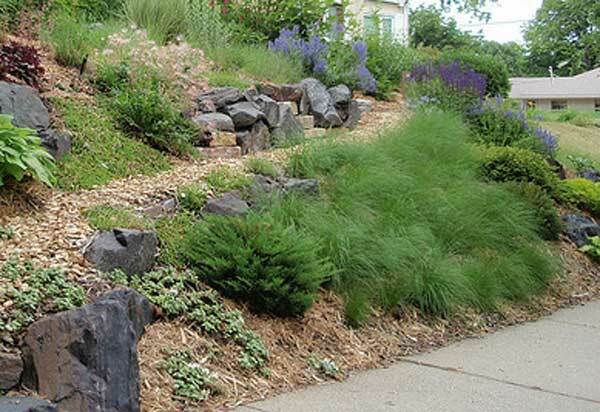 Strangely, prairie dropseed is also used extensively in residential and commercial landscape plantings, and for roadside revegetation. In many of the landscape plantings, specially selected "cultivars" are used, such as Tara, Chanticleer, or Winter. Presumably these cultivars have been selected from desirable-looking plants found in natural settings.The photo below shows a typical situation. In the Madison area, dropseed can often be found growing in special beds near commercial banks, shopping centers, or dividers within parking lots. Some of these populations may even set seed! The Floristic Quality Index (FQI) has become a widely used measurement of natural areas quality. This standardized tool was developed by Floyd Swink and Gerould Wilhelm at the Morton Arboretum, and is explained in detail in their book: “Plants of the Chicago Region”, published by the Indiana Academy of Sciences. FQI is not a stand-alone value, but is used together with other assessments to evaluate the quality of a site. Measuring the FQI begins with an assemblage of a complete species list for the site. Each species is assigned a unique Coefficient of Conservatism (a number from 0 to 10), which expresses the probability that this plant species is likely to occur in landscapes relatively unaltered from those of pre-settlement times. Plant species with high C values are relatively specialized in their requirements, and are thus found in more restricted habitats. C values are assigned to species on a state-wide basis, and the C values for Wisconsin plants can be found in an extensive publication edited by Thomas Bernthal issued by the Department of Natural Resources. Since 2002 I have been keeping detailed records of plant species at Pleasant Valley Conservancy. This year Amanda brought together all data from 2002 through 2015 (13 years), sorted them by management unit, and then applied the C values and made the FQI calculation for each unit. The table below provides the data, sorted by FQI (highest on top). Also given in the table is the acreage and total number of species for each unit, and a brief description of its ecological character. The location of each unit can be found in the Management Map found at this link. The single highest FQI was in Unit 6, an outstanding hill prairie/savanna. This unit is a large remnant with a bur oak savanna above and in the gullies and dry mesic prairie on the lower slopes. Before restoration had begun this unit, although fairly degraded, had a well developed tallgrass prairie flora with a big bluestem remnant at the top under the rocks and little bluestem on the lower slope, and two moderately sized Indian grass patches. Also, high FQI values were found in Unit 11A, Unit 10, and Unit 12A, all of which are well-restored oak savannas. Other units with high FQI values were three of the older and larger planted prairies (Toby’s, Valley, Pocket) and four of the larger savanna areas (Units 5, 8, and 12B. Other high FQI values were found in the larger units (not surprising, because the larger units in general had more species). The rest of the data for units at PVC, all with FQI values over 30, are given in the table below. Another interesting analysis is that of the various planted prairies at PVC. The table below shows, not surprisingly, that the older planted prairies have higher FQIs than the younger ones.